Statham! Owen! De Niro! It's the "Killer Elite" Trailer! 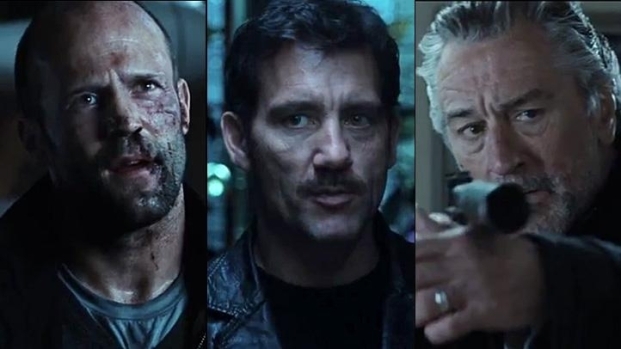 The only thing weirder than Clive Owen taking second billing behind Jason Statham is Robert De Niro taking third billing behind Statham and Owen. But that's the world we live in if the new trailer for "Killer Elite" is to be believed. "Killer Elite," the first feature from Irish writer-director Gary McKendry, is based on Sir Ranulph Fiennes book, "The Feather," which the author claims to have been based on actual assassination carried out by the British Special Air Services, who eventually went to war with a crew of vigilante special forces guys who decided to fight back. Jason Statham tries to rescue his mentor, Robert De Niro, from the clutches of the evil Clive Own in this battle of black-ops assassins. Opens Sept. 23. Based on a true story [Ed. note: what movie isn't based on a true story these days? ], Killer Elite races across the globe from Australia to Paris, London and the Middle East in the action-packed account of an ex-special ops agent (Jason Statham) who is lured out of retirement to rescue his mentor (Robert De Niro). To make the rescue, he must complete a near-impossible mission of killing three tough-as-nails assassins with a cunning leader (Clive Owen). The trailer is loaded with fast-paced action, and its got two talented actors and one pretty good tough guy leading the way, in addition to a hot blond, Yvonne Strahovski of "Chuck" fame, who knows her way around shoot-em ups. Oscar bait? No, probably not, but it looks like it could be dumb fun. "Killer Elite" opens Sept. 23.